Thank you for your letter of today, and for the 110-franc note it contained. 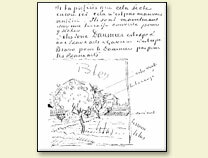 As for the earlier letter with the 50 francs, I got it too, and I wrote you about it the day, or two days, before I sent the two drawings. These drawings were made with a reed sharpened the way you would a goose quill; I intend to make a series of them, and hope to do better ones than the first two. It is a method that I had already tried in Holland some time ago, but I hadn't such good reeds there as here. I have had a letter from Koning, please thank him for it; I shall be very pleased to exchange the two drawings for one of his studies, which you must choose and keep in your collection. I will write him to explain the method and send him some sharpened reeds so that he can try it too. This is important news - your journey to Brussels. You will be able to judge how the old high-priced stuff is going there. But what a business! For probably these fellows are planning some move. Do you remember that we talked about it before I left, and said that in expectation of the Universal Exhibition Bouguereau, Lefèvre, Benjamin C. [Constant], the whole set, would go to Boussod's to complain and to insist that they count on the firm of B's (the best in the world) remaining true and faithful to the principles of that art which is in truth the most civilized and most attractive - that is to say their own pictures. Whatever it may be, it was pretty disquieting. And the situation would become serious if you quarreled with these gentlemen. I don't disguise from you that it will be a pretty severe blow to you; not at the moment but say six months later, because of the change in your way of life that it would bring about. When a man comes out of prison after having been there a long time, there will be moments when he will even miss his prison, because he finds himself at a loss now that he is at liberty - so called, I suppose, because the grinding daily task of earning your living hardly leaves any liberty at all. But you know all this. You will certainly regret some things in spite of yourself, even while you are gaining others. I have ten orchards now, not counting three little studies, and one big one of a cherry tree, which I've spoiled. When will you be back and what exactly am I to do about sending things? - for I must get fresh subjects, as most of the flowering in the orchards is over. Therefore, these orchards, with the Pont de l'Anglais, constitute a first series. If you would rather leave them to dry out here, perhaps it would be as well. They are now on a covered terrace to dry. I say, Daumier is on view at the Beaux-Arts and Gavarni too, aren't they? Bravo for the Daumier, but not for the Beaux-Arts. Here is a sketch of an orchard that I planned more particularly for you to celebrate May 1. It's absolutely clear, and done all in one go. A frenzy of impastos of the faintest yellow and lilac on the original white mass. You will probably be in Holland by then, and perhaps you will be seeing the same trees in flower there on that very day. I am very glad you have taken lessons in eating from young Koning. He is thoroughly well up on it: and it's amusing to eat with that budding young artist. I am very pleased that you have got his study of the Negress. But indeed, it will do you good to have breakfast. I do it here myself, and eat two eggs every morning. My stomach is very weak, but I hope to be able to get it right; it will take time and patience. In any case I am really much better already than in Paris. Besides, one doesn't really seem to need a great deal of food here, and while I think of it, I want to tell you that more and more I doubt the truth of the legend of Monticelli drinking such enormous quantities of absinthe. When I look at his work, I can't think it possible that a man who was flabby with drink could have done that. Perhaps that Limoges woman, the La Roquette female, set her evil tongue wagging and so the legend took root. I am writing in haste so that you will get my letter before you leave, if it is this Sunday that you intend to start. Although I do not think that the journey will be very delightful if Delort & Co.'s pictures are to be the bulk of the collection designed for the worthy Belgians, all the same I wish you a good time, and a good journey, and above all be of good heart. I saw Bernard's still life unfinished, and thought it magnificent. A handshake for you and Koning. Vincent van Gogh. Letter to Theo van Gogh. Written c. 21 April 1888 in Arles. Translated by Mrs. Johanna van Gogh-Bonger, edited by Robert Harrison, number 478.